Software testing is the process of testing the product’s functionality and layout both over the demo as well as the live server. Testing is required to identify the bugs from the tester’s eye which slips out at times from the developers view so that, we deliver the perfect product to the client. Testers have an eye for product and they can identify the strength and weakness in the software. They can also suggest ways to improve the quality of software. We recommend a fully tested website. This is because we understand the inside of a website and the problems that could actually affect the functionality of the website in the near future after a course of time. We properly measure the weight and length of the code used during our testing phase. Also, we take care of the functionality as well as the UI of the website once it enters the live server. There is for sure difference in the demo environment and the live environment. It is similar to a bike racing in video game and in real life. Your website has to take a lot of load over it due to foreign codes interacting with it hence, it is necessary to optimize the code and make it network friendly. Here you require a tester who performs the load testing. At W3care, we pride ourselves on our attention to detail and our quality assurance methods. When you hire us for QA and testing services, you know that your website will be free of bugs, protecting your reputation and helping you to generate more revenue with our Quality Testing Services. We are responsible to all of our clients to provide a bug-free product. This is why we take extreme measures to ensure that all of the websites and applications we create are completely tested before they become live. We follow Agile QA testing to save time and perform best quality testing services to your project. Our testers work with developers to ensure time saving on the project as a whole. We also detect errors that are presented due to gaps in requirement gathering and modify the product accordingly. At each stage of application development, our experienced team members test for all errors in the system, ensuring that every facet of your system runs smoothly. Our aim is to provide reliable software testing solutions to our global clientele. 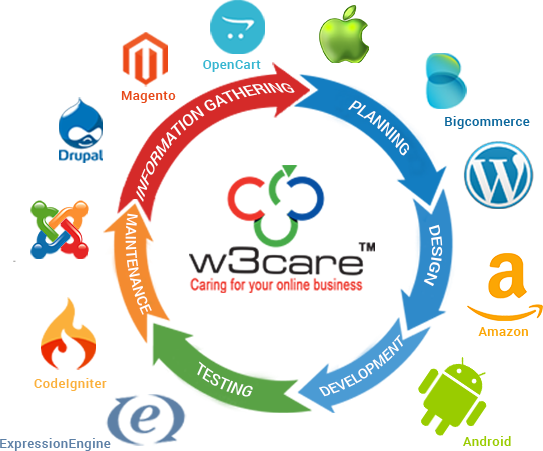 W3care Technologies is process-driven IT organization and just accentuation on customer's fulfillment. We work with energy, straightforwardness, assurance, ingenuity, and specialized competency to satisfy your objective. We have an expert team of quality analyst who make sure to deliver best quality of website and mobile app to client. Our team checks all functionalities properly before delivering the projects. Navneet and the team at W3care have shown me their professionalism and prompt response. W3care's ability to deliver work on time and under budget have allowed me to focus on our strategy for expanding our user base. We will continue to work with W3C as we love their innovative and active approach to web design and development.